Lee Woolery | Speedshot Photography Reuben Pelayo, owner of El Sombrero, helps serve meals at a previous Thanksgiving dinner at the Troy restaurant. The restaurant has served a free Thanksgiving meal to the community for going on 20 years. TROY — Turkey and all the fixings — mixed in with some fellowship — will again be offered free to the community this Thanksgiving. For the 24th year, El Sombrero restaurant in Troy, located at 1700 N. County Road 25-A, will again offer a free Thanksgiving feast to the public. Continuing to fulfill a promise he made to his mother to help his community, restaurant owner Ruben Pelayo will offer the annual community dinner from 11 a.m. to 4 p.m. Thursday, Nov. 22 — or until the last visitor is served, Pelayo said. Pelayo said he has continued the free meal for a number of reasons, including making his mom and “American mom” Judy Rose proud. Serving the community, something also close to Pelayo’s heart, also propels him. “It’s not just me. Yes, we started (the meal), but the community has kept it going,” said Pelayo, who has been honored by several organizations for his work in the community. The meal, a traditional Thanksgiving turkey dinner with all the trimmings, will be offered for dine-in only. This year’s feast will include turkey, sweet potatoes, mashed potatoes and gravy, dressing, green beans, cranberry sauce, rolls and pumpkin pie. There will be no carry-outs or deliveries. Both Pelayo and Rose stress that while they absolutely want to reach out to those in need, the meal is for anyone who wishes to have a good dinner or socialize with others. Employees begin cooking some 125 turkeys the week prior to Thanksgiving in order to have them all ready for the dinner. “I find it fun to come in the week before and smell turkeys cooking instead of Mexican food,” Rose said. Rose said a core group of about 12 people help to plan the dinner each year; however, many more volunteers — most longtime customers — help in the restaurant on Thanksgiving Day. “They are what make the meal happen each year, we couldn’t do it without them,” he said. Employees, many from Mexico, are paid, and see the holiday as just another day of work, Rose said, as Thanksgiving is not recognized in their country. The meal again will be a sit-down dinner, with each visitor being personally served. In recent years, the restaurant has received help from the public and vendors to offset the cost of the dinner. However, Rose said in all, the dinner will cost upward of $16,000 to serve the thousands of area residents who will visit. Rose said some of their suppliers donate supplies for the meal. Community members also drop off turkeys they either have purchased or received from their employers. Local businesses also have come together to help with the meal by making donations, Rose said. “We are most thankful for all the donations,” Rose said. A table with homemade items, many made by Rose herself, also is set up in the Troy restaurant. Any money made from the items — all handmade — is put directly into the fund for the annual meal. Pelayo said he plans to continue the annual outreach to the community for as long as he can. “I hope for another 20 years, God willing,” he said. Any leftover food from the meal is immediately donated to the Bethany Center in Piqua and St. Patrick Soup Kitchen in Troy, according to Pelayo — so much so that Rose said she sometimes can’t manage enough turkey to have a sandwich the day after. 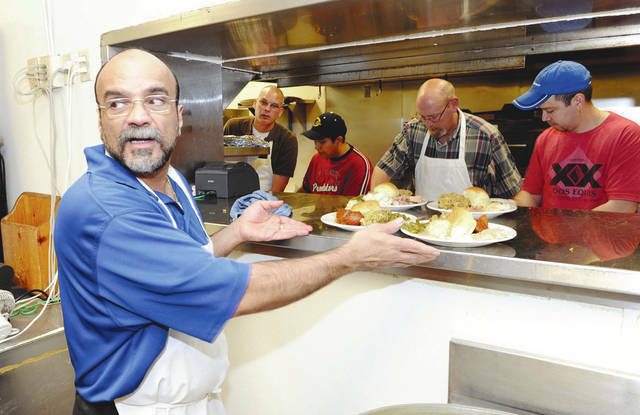 https://www.dailycall.com/wp-content/uploads/sites/30/2018/11/web1_ElSombrero1-1.jpgLee Woolery | Speedshot Photography Reuben Pelayo, owner of El Sombrero, helps serve meals at a previous Thanksgiving dinner at the Troy restaurant. The restaurant has served a free Thanksgiving meal to the community for going on 20 years. Melody Vallieu can be reached at (937) 552-2131 or follow her on Twitter at @TroyDailyNews.